This winter is record breaking in terms of dropping temperatures. The cold weather is not only inconvenient and uncomfortable… but it can also be downright deadly. Prolonged exposure to cold temperatures, wind or moisture can lead to frostbite which can have serious consequences on your skin and limbs. Frostbite is the most commonly occurring injury caused by cold weather. Frostbite comes in three stages. Frostnip is the first stage and will irritate the skin but is unlikely to cause any permanent damage. Superficial frostbite, the next stage, penetrates the dermis layer of skin and causes fluid-filled blisters to appear. The most serious stage is deep frostbite. In this phase, the tissue begins to harden and blacken as it dies. Joints and muscles may lose all function. In some deep frostbite cases, amputation may be necessary. The best prevention for frostbite is to stay warm and dry. It’s very important to wear the proper clothing as exposed areas of skin are particularly susceptible. Remember the importance of hats and ski masks to protect the ears and nose, and water-proof shoes or boots to keep your feet warm and dry. While outside, it is important to seek shelter if you suddenly encounter a winter storm or sudden and severe temperature drop. If you think you have frostbite, check your skin for white, gray or yellow waxy patches on areas that feel particularly cold, hard or numb. Frostbite usually affects the hands and feet, so be especially mindful of these areas. Go indoors and seek medical attention as quickly as possible. After the victim is out of the cold, remove any jewelry or clothing that appears to be restricting blood flow to the frostbitten areas. DO NOT rub the skin in attempts to promote circulation. This creates friction which will break up the frostbitten skin and underlying tissue, and raise the risk of infection. Sterile gauze can be inserted between toes and fingers to prevent them from sticking together. Warm frostbitten areas in water that is 100-105 degrees Fahrenheit for 20 to 45 minutes or until the afflicted skin softens. Elevate the afflicted areas to help with pain. Frostbite is serious business that can cause permanent damage. Following these tips will help you to prevent frostbite, but the best way to evade it is to stay out of the cold altogether. 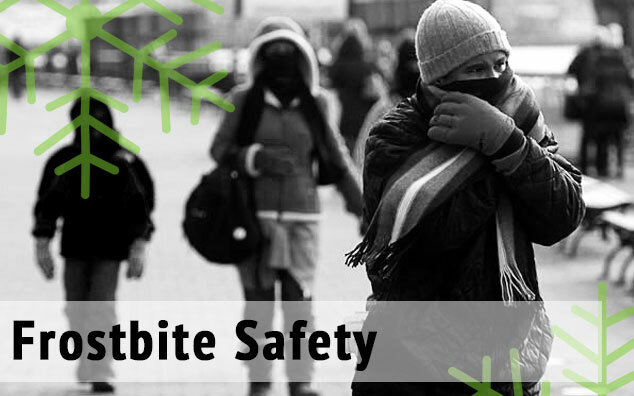 During bouts of severe cold, don’t go outside unless absolutely necessary or at the very least, limit your exposure.